Griffin Dunne: Reflections On His Father, Dominick The actor and director shares memories and discusses the work of his late father, journalist and novelist Dominick Dunne, who became famous for covering the lives and trials of celebrities. He died in August 2009 at age 83. 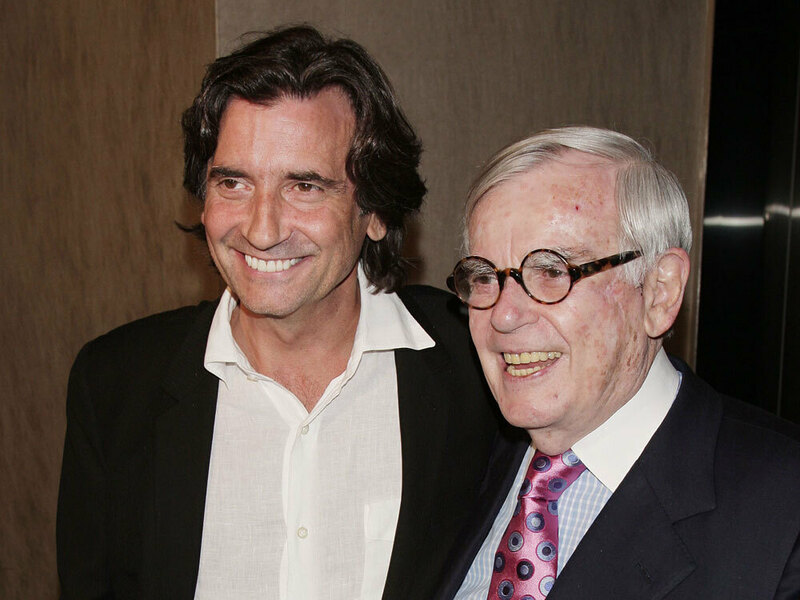 Dominick Dunne (right) attended the premiere of his son Griffin's film Fierce People in 2007. When journalist and novelist Dominick Dunne died in August at age 83, he left behind a body of writing that brought together crime, celebrity, Hollywood and personal tragedy. His son Griffin Dunne joins Fresh Air host Terry Gross to share memories and discuss the work of his late father. Dominick Dunne became famous for covering the lives and trials of celebrities, but he began his career in crime writing after attending the trial of the man who killed his daughter, Dominique. Dominick Dunne wrote several books, produced films for Hollywood, and was a special correspondent for Vanity Fair for 25 years. 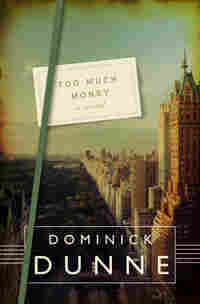 His final novel, Too Much Money, has been published posthumously. It's about a famous author who writes about his friends and acquaintances in Hollywood. Griffin Dunne starred in the movies An American Werewolf in London, After Hours, and Quiz Show, and has made numerous appearances in other films and TV shows. He has also worked as a director (Fierce People, Famous, and The Accidental Husband) and producer (Fierce People, Running on Empty and After Hours). He is currently adapting the Meg Wolitzer novel The Position for HBO. This interview was originally broadcast on December 15, 2009. A few years ago there was a rumor that I had been murdered at my house in Prud'homme, Connecticut, by a cross-country serial killer of rich older men. Of course, it wasn't true, although it was a rumor that lingered for a while: Gus Bailey was dead. There was indeed a serial killer at the time, who was very much in the news. He had just killed a couturier in Miami who was so famous that Princess Diana and Elton John and his future husband attended the funeral in Milan. I confess now to having been the person who started the rumor. I couldn't figure out how to finish a novel I was writing at the time, and I wanted desperately to leave the next day for the Cannes Film Festival with Stokes Bishop, my editor at Park Avenue magazine, who assured me in advance that I was to be seated between the French film star Catherine Deneuve and Princess Olga of Greece at the magazine's party at the Hôtel du Cap in Antibes. I didn't want to miss that so I just grabbed the headline news of the murder in Miami and added Gus Bailey to the killer's list, thus ending the novel, and I flew to France. Do I regret having done that? Yes. My name is Augustus Bailey, but I am called Gus Bailey by everyone who knows me. It happens that I am often recognized by strangers on the street, or in public places, and even those people call me Gus. I only use Augustus Bailey on my passport, my driver's license, the covers of the books I write, my monthly diaries for Park Avenue magazine, and the weekly introductions on my cable television series, Augustus Bailey Presents, which I host. I thought it best to tell you a bit about myself before I get into the story that I am about to tell. It should be pointed out that it is a regular feature of my life that people whisper things in my ear, very private things, about themselves, or about others. I have always understood the art of listening. Losing the occasional friend along the way goes with the writer's territory, especially if the writer travels in the same rarefied circles he writes about, as I do. In time, some people come back. Pauline Mendelson did. She was a very good sport about the whole thing. Mona Berg did, sort of. Cecilia Lesky did. Maisie Verdurin adored being a character in one of my books and bought fifty copies to give as Christmas presents. Others didn't, of course. Justine Altemus, my great friend Lil Altemus's daughter, never spoke to me again. Only recently, Justine and I were seated side by side at a dinner dance at the Colony Club, celebrating Sandy Winslow's ninetieth birthday, and we never so much as looked in each other's direction for the hour and a half we were table companions. Not too long ago I had intended to give myself a party on the occasion of my upcoming birthday, a milestone birthday, which I must confess I never thought I would reach, especially in the last two years of stress and high anxiety. This was all caused by a monstrously unpleasant experience involving some monstrously unpleasant people, who had no place in my life and took up far too much time in it, particularly when the years left to me are dwindling down to a precious few, as Walter Huston used to sing. But it is a fact that the fault was mine. I fell hook, line, and sinker for a fake story from an unreliable source. I thought I had the scoop of my career, and I made the fatal mistake of repeating it on a radio show of no importance, and the consequences were dire. If you must know, I accused a congressman, former congressman Kyle Cramden, of knowing more than he was admitting about the case of the famous missing intern, Diandra Lomax. I made a mess, I tell you. I tried to distract myself from my troubles by focusing on party planning. When my birthday party guest list grew to over three hundred, and I was only at the P's, I realized I would have to rethink things. I know entirely too many people. Although I have several very serious enemies in important positions, I hope not to appear immodest when I say that I am a popular fellow, who gets asked to the best parties in New York, Los Angeles, London, and Paris, and goes to most of them. I decided to limit my party to eighty-five people, which is the age that I will soon be. It was so difficult to hone my friends to eighty-five. It doesn't even scratch the surface. Eighty-five, in fact, really means forty-something, with wives, husbands, lovers, and partners making up the other forty or so. There would be hurt feelings, to be sure. That's why I don't like to give parties. I go about a great deal in social life, but I never reciprocate. The spacious terrace of my penthouse in the Turtle Bay section of New York City, where I have lived for twenty-five years, has a view of the East River, and could easily hold a hundred people or more without much of a squeeze, but I have never once entertained there. I felt, however, as if I deserved a party. But it was not to be, as you will find. Things happen. Everything changes. I've noticed that concurrent with the growth of my public popularity, there is a small but powerful group of people who are beginning, or have already begun, to despise me. Elias Renthal, still in federal prison in Las Vegas as this story begins, is one of my despisers. Countess Stamirsky, Zita Stamirsky to her very few friends, is another who despises me after I refused to not write about her son's suicide from a heroin overdose while he was wearing women's clothes at the family castle in Antwerp. And, of course, there is Perla Zacharias, allegedly the third richest woman in the world, who had me followed by investigators trained by the Mossad in Israel who collected information that she later threatened to use against me. That's the kind of person Perla Zacharias is. I have written about all these powerful people in Park Avenue, or in a novel, and earned their eternal enmity. Their time would come, I always thought. Elias Renthal knew what he was screaming about when he said, "They're going to get you," his face all red and ugly, as he pointed his finger in my face, only moments before he collapsed on the floor of the men's room of the Butterfield Club. 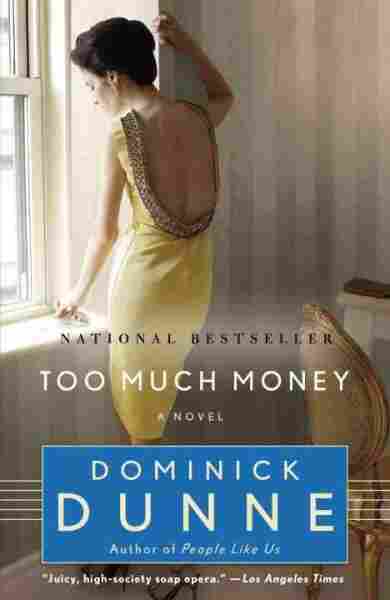 From Too Much Money: A Novel by Dominick Dunne. Published by Crown. Used by permission of the publisher. All rights reserved.